Rep. Brian Mast (R-FL) has zero tolerance for football players who choose to kneel during the national anthem. Mast, who served as a bomb disposal expert in Afghanistan, lost both of his legs in an IED blast. Yet, even he stands for Old Glory. "I know as well as anyone that the act of standing is not something to be taken lightly," he added in a follow up Facebook post. "Here's when I've taken a knee: after jumping out of a helicopter, mourning a fallen brother and in church. During the National Anthem? Hell no." Mast appeared on "Fox & Friends" Wednesday, where he explained how patriotism was "stolen" from us thanks to the NFL's antics. President Trump shares Mast's impatience with the kneeling football players. At first he had insults for Colin Kaepernick and those who followed his lead, calling them "SOBs," but he took a more measured tone Tuesday at a joint press conference with Spanish Prime Minister Mariano Rajoy. At the presser, the president explained that he recently visited Walter Reed Hospital in Maryland, where he met some of those brave men and women who fought for our country and are now trying to recover from their wounds they endured for us. How can our athletes be so disrespectful after all veterans have sacrificed, Trump wondered aloud. Attorney General Jeff Sessions agrees with the president and has even suggested the NFL take action to prevent any more footballers from disrespecting the anthem. 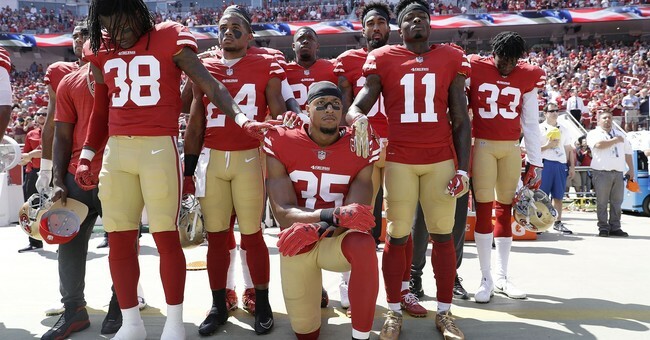 Over 150 players protested over the weekend, but plenty more stood for the red, white and blue. New Orleans Saints quarterback Drew Brees had a touchdown take on the situation. To summarize his sentiments: You can protest Trump, but don't do it in front of the flag.